The 2018 E! 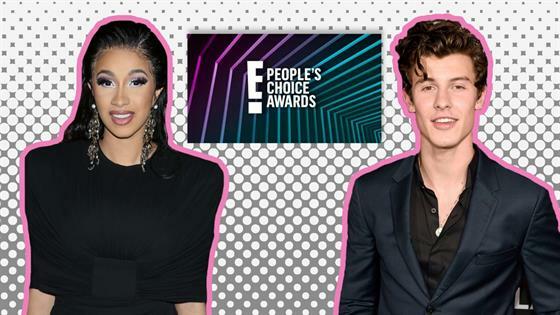 People's Choice Awards are almost here and there is still a lot to discover about the award show. For starters, we don't know who you chose to win each of the 43 categories, but you can go over the finalist list as much as you'd like until the big day arrives and the winners are finally announced! The show airs on Sunday, Nov. 11 on E! in case you needed a little reminder, which is so close. Ahead of the live award show, which is all about having the people's voices heard in every aspect throughout the event, we are able to give you a sneak peek at one major thing that will be featured at this year's show...the 2018 PCAs trophy! The newly redesigned trophy is a real beauty and it is brought to you by London-born, and New York-based, designer Anna Karlin, who just so happened to give E! News the inside scoop on the newly remodeled award this week. On Thursday, E! News caught up with Karlin and she spilled all the details about this year's golden prize and we have all them for you below, including what the inspiration was for this fresh trophy design. "Well, the idea was that they wanted to still keep it relevant with the exclamation point. But then I obviously was looking at it from a sculptural lens and how you make that this sort of lovely piece of usable sculpture," Karlin exclusively told E! News. "But also sort of still had, like trophies have to be glam. So, had that sort of feeling of Hollywood glamour." The trophy is much more modern and sleek than other iconic pieces of hardware being handed out around the Hollywood award show circle and there is a reason for that. "I think it's a completely different design language. It's a piece of sculpture rather than something that's derivative of something," the designer explained. "I think most of the things out there are a literal star, or person, or something that is much more literal. This is more abstract." Despite being abstract and giving off a modern art sculpture vibe, the People's Choice Awards trophy is gold, well it's brass, but it gives off a golden hue, which is not a super shocking color choice since first place medals are also that color. "That came along [in the design process]. There were different options, different material palettes and different options," she said. "This option was the desired material palette." In case you didn't see it upon first glance, this spectacular trophy is in the shape of the iconic E! exclamation point logo, which was the plan from the very beginning. "That was the brief. They were like we want it to have something to do with our logo, but they were very open to it being abstract and as creative as possible," Karlin revealed when discussing the nod to the network. "They didn't want to hinder any creative process, but they definitely had that in the brief." When it comes down to what Karlin wants fans and celebs to know about this design—which comes in at 12 inches tall and weighs 4.6 pounds—it's that "it was designed with love and care." Based on the gorgeous photo, we can definitely see the love and care she's talking about. To see who takes home these beauties this year, don't miss the 2018 PCAs airing next month.